One of my favorite brands of ready-made vegetarian baked beans. When throwing a summer party, baked beans are always a favorite. They obviously aren't as healthy as having plain beans because of the added sugar, but once in a while it's worth the indulgence. Beans are high in fiber which helps you lower your cholesterol and stabilize your blood sugar levels. This is one of the dishes on my Summer Solstice Party menu that we served at our family gathering last week. When you are feeding a crowd, it's nice to have a dish that goes together quickly. I've made baked beans from scratch but it's a lot of work and I've never been able to duplicate the taste of using Bush's beans in this recipe. After adding just a few additional ingredients I generally let the beans simmer in a crock pot all day but you can also make them on the stove. If you are feeding fewer people, cut the recipe in half. If you are feeding a larger crowd, double the recipe. Baked beans make great leftovers. My daughter loves to eat them along side scrambled eggs. Are Canned Vegetarian Baked Beans Considered Vegan? Some products, like Amy's organic vegetarian beans, state that they are vegan on the label. Although Bush's does not, they replied to this question by stating that they are "free of meat and meat by-products" and that all of their products are "dairy and casein free". Their ingredients do however include "sugar" (although most of the sweetness is from brown sugar) and they do not specify whether it's cane or beet. Some cane sugar refineries use bone char in the filtering process which discourages many vegans from using cane sugar but many refineries do not. Brown and beet sugar does not go through this process. Sauté the onion in oil for 5 minutes. Drain most of the juice from one can of beans and use all of the juice from the other. Put the onion, the beans and the rest of the ingredients in a crock pot and simmer on low all day or on high for 4 hours or more. Get a big slotted spoon and serve your guests from the crock pot. Using a 5 quart Dutch oven, sauté the onion in oil for 5 minutes. Add all the rest of the ingredients and simmer uncovered, stirring frequently, until the beans are thick and bubbly. Serve. Per serving: 151.3 calories, 1.2 g fat, 0.2 g saturated fat, 0 mg cholesterol, 6.1 g protein, 31.8 g carbohydrates and 5.3 g of fiber. Our family started a tradition last year to gather at our home in Sebastopol, California to celebrate the Summer Solstice. This was our second celebration and I definitely think this tradition is going to stick! The kids, grandkids and extended family traveled here from Portland, Minneapolis, San Francisco and New York. A week of swimming, game playing, movie watching, cooking, visiting local attractions and soaking up the California sun culminated in a big party on Saturday evening. With 29 adults and children, all with different eating habits, the menu becomes quite a challenge. So we typically have a combination of raw, vegan, vegetarian, seafood and BBQ'd turkey tenderloins so that everyone can find something they can enjoy. And of course, lots of Sonoma wines. This year, everyone pitched in to prepare our feast. My daughter-in-law Karina brought tons of organic lettuce and other veggies from her garden in Portland and made a giant raw salad. She has now converted her entire yard to raised bed gardens (You can see her garden in my post, 10 Good Reasons to Plant a Garden). Another dish we served was an orzo salad that my daughter Linda prepared. It's a nice combination of organic pasta with lots of raw veggies and was inspired by our Garbanzo and Raw Kale Salad. I thought you would enjoy this fresh and healthful recipe. My Sweet and Spicy Vegetarian Baked Beans and Shrimp and Artichoke Salad were also well received. Combine and mix all of the dressing ingredients in a small bowl. 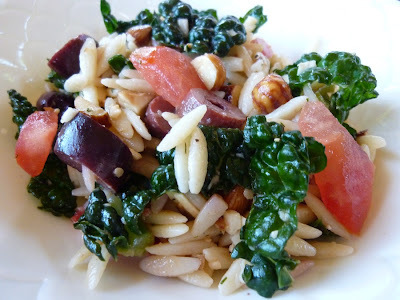 In a large bowl, massage the kale with a few tablespoons of the dressing and let sit while you cook the orzo. Let the orzo cool a bit and mix in with the kale. Add the tomatoes, kalamata olives and either the parmesan or nutritional yeast. If you are going to serve immediately, mix in enough dressing so that it is well dressed but not over dressed. If you are going to serve the salad later, add more or all of the dressing as the pasta will absorb it. Top with hazelnuts. Per serving (8 servings with parmesan): 196.8 calories, 9.8 g fat, 1.1 g saturated fat, 1.4 mg cholesterol, 5.5 g protein, 26.3 g carbohydrates and 1.9 g of fiber. Per serving (8 servings with nutritional yeast): 200.1 calories, 9.5 g fat, 0.9 g saturated fat, 0 mg cholesterol, 6.2 g protein, 27.4 g carbohydrates and 2.5 g of fiber. Break corn in half, lay down horizontally and cut off kernels. You know it's summer when beautiful ears of white or yellow corn are available at very reasonable prices. And although corn is getting a bad name because of its overuse in our society (for example, being made into unhealthful foods like high fructose corn syrup) fresh organic corn is a good source of important nutrients. Besides being high in fiber, corn provides significant amounts of vitamins B1 and B5 (thiamin and pantothenic acid), folate, vitamin C, phosphorus and manganese. It's also high in fiber. Buying "organic" corn ensures you that it's not genetically modified. This salad is simple to make as well as light and refreshing. And I get to use my newly planted fresh basil from my Herb Garden in Recycled Plastic Tubs. It's funny that people eat raw corn in salads and salsas all the time but rarely pick up a raw corn on the cob. Raw corn on the cob is one of my favorite things to eat in the summer. It certainly is simple to make and you avoid all that high calorie butter, margarine and salt. Cutting corn kernels off the cob for a salad can be challenging. Corn can fly all over your kitchen and you can spend more time cleaning up than preparing the dish. One way to make this process easier is to first snap the corn cob in half and then lay it down and cut the corn off horizontally instead of vertically. Give it a try! Combine corn kernels, red bell pepper, red onion and basil in a large bowl. In a small cup or bowl, mix lime juice, olive oil , salt and pepper. Pour dressing over the corn mixture and toss until combined. Serve with a sprig of basil for garnish. Per serving: 102.7 calories, 2.8 g fat, 0.3 g saturated fat, 0 mg cholesterol, 2.6 g protein, 16.5 g carbohydrate and 2.4 g of fiber. Beware Of Pine Nuts From China! This week I posted a Raw Dolmas Recipe using sprouted garbanzo beans and pine nuts. I was a little reluctant to use pine nuts since they were very expensive but they are one of my favorite nuts so I splurged. I have very fond childhood memories of eating Italian pignoli cookies, a soft chewy cookie that is completely covered with pine nuts. A few days after eating my raw dolmas, I ate a piece of watermelon. It tasted very bitter and metallic. I assumed it was bad. The next thing I ate was some fresh strawberries I bought from my favorite road side stand in Sebastopol. They tasted terrible. I soon realized that EVERYTHING I ate tasted bitter and metallic. I thought maybe one of my vitamins was just leaving a metallic taste in my mouth. It was a complete mystery and extremely annoying. After several days of this, I started to really worry. I googled "bitter taste in my mouth" and immediately found countless articles on pine nuts! The articles described a rare condition triggered by consuming certain pine nuts that causes food to taste bitter and metallic. Although most articles would not pin this on China, this condition is a recent phenomenon and began when Chinese pine nuts started flooding the market. I called Whole Foods, where I purchased these pine nuts for $26 a pound, and asked them the source of the nuts. The answer was CHINA! This confirmed what many of the articles inferred, that the pine nuts that ruin your taste buds could be from China. According to pinenut.com, in 2001 the U.S. purchased 45% of China's pine nut crop. Pine nuts are also produced in Spain, Turkey, Italy, Portugal, Russia, North Korea, Afghanistan and Pakistan. This bitter mouth condition begins 1 to 3 days after eating the bad nuts. For me, it is starting to go away after a week but I've read that it could last for weeks. So if you make my Raw Dolmas recipe, look for Italian pine nuts. If you can't find anything but Chinese pine nuts, try substituting English walnuts. Select nice, large leaves of organic chard. Gently clean chard leaves, remove stem, and marinate. Place mixture on a strip of chard and roll up dolmas. Traditionally, dolmas are stuffed grape leaves. Known as a Greek delicacy, they are also made all over the Middle East and other parts of the Mediterranean. Dolmas are typically made by stuffing cooked grape leaves with various combinations of rice, lamb, currants, pine nuts, lemon zest, onions, herbs and spices. The traditional version is very time consuming to make. This "raw vegan" recipe is quite simple to assemble but does require a few days to sprout the garbanzo beans. They make a wonderful appetizer or snack (I've been snacking on these for the past few days!). Dolmas would also be a good thing to eat for lunch. You can add this to your menus when you do your Raw Food Cleanse. I made quite a few changes to the typical ingredients for dolmas. 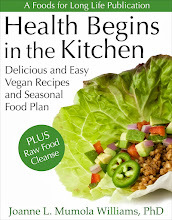 I substituted sprouted garbanzos for the cooked rice and used raw chard instead of the grape leaves. Garbanzo beans are one of my favorite "long life" foods. They are high in protein and low in saturated fat. Their high fiber content helps lower cholesterol levels and stabilize blood sugar levels. They are a complete protein, containing all essential amino acids, and are an excellent source of molybdenum and manganese. They are also a good source of copper, phosphorus and iron. Try making Raw Hummus with Sprouted Garbanzo Beans or Garbanzo Bean and Raw Kale Salad with Lemon-Turmeric Dressing. Swiss chard is also an exceptionally healthful food. One cup of raw chard has only 7 calories yet it provides more than 3 times the daily requirement of vitamin K. It's also an excellent source of fiber, vitamin A, vitamin C, vitamin E, magnesium, manganese, potassium, and iron. Try different ingredients in your dolmas. Add currants or substitute some or all of the parsley with mint. Instead of garlic, try thinly slices green onions. Add some of your favorite spices. To sprout garbanzo beans, soak 1/3 cup of dried, organic garbanzo beans overnight in a sprouting jar. Rinse gently the next morning, put on the sprouting lid and turn the jar over to drain the water. Let the jar sit upside down and tilted (so oxygen can get to the sprouts) and not in direct sunlight. Rinse them 3 times a day in cool water for 3 days until sprouted. Once the garbanzo beans are sprouted, you can prepare the dolmas. Gently wash the chard leaves, being careful not to tear the leaves. Remove the stems and place the leaves in a large bowl with the marinade of lemon juice, olive oil and salt, making sure each leaf is covered in the mixture. Set aside. Drop the garlic through the shoot of a running food processor with an S blade and process until it is minced. Add the sprouted garbanzo beans, lemon juice, olive oil, sea salt and lemon zest and process until fairly smooth. Add the pine nuts and continue to process until they are well chopped. Add the parsley and pulse a few times until combined. Cut the marinated chard into 2" by 4" strips. Place a spoonful of the garbanzo mixture onto the inside of the chard strip and roll up. This should make about 14 rolls. Per dolmas (not counting the marinade): 62 calories, 4.6 g fat, 0.4 g saturated fat, 0 mg cholesterol, 1.8 g protein, 4.4 g carbohydrates and 1.3 g of fiber. Some herbs taste significantly different when dried and some don't. For example, I think dried dill tastes pretty good so when I grew fresh dill last year, I didn't think it was really worth all the garden space it took. But herbs like sweet basil, parsley and cilantro, to name a few, taste completely different when they are fresh. So if you want to use fresh herbs in your cuisine, you have two choices. Buy them or grow them. Buying herbs presents several problems. You usually need a very small amount but must buy a lot more than you need and certainly more than you want to pay for (especially when they are organic). It's also very inconvenient to have to run to the store every time you need a sprig of parsley or a tablespoon of fresh cilantro. So I like to grow my own. I have plenty of room for vegetable gardens but this year I decided to plant my herbs in plastic tubs. The biggest reason was convenience. My gardens are in the back yard, down a flight of stairs and a ways from the kitchen. I really like to have my herbs close to where I prepare food. So this year I took a bunch of plastic tubs I've been saving (the ones you get when you buy organic spinach and salad greens), stabbed a few holes in them with a knife, filled them with organic potting soil and planted my favorite herbs. Best of all, they are a few feet from my kitchen door! Another advantage of tubs is that it keeps some pervasive herbs, like mint, from taking over the entire garden. When I pick out herbs, I am always tempted to buy seeds or starts of every herb on the planet. And without fail, I use the basil, rosemary, parsley, mint, cilantro and thyme and watch the other herbs bolt. So now I try to control myself and only plant what I actually use.